As I hit the throttle on the last test of our three roundups of the year, I was catapulted to 30 mph in 1.5 seconds, which is a sensation not many people — maybe human cannonballs — will ever experience. I was aboard Yamaha’s newest WaveRunner, the GP 1800, a frighteningly fast and agile out-of-the-box racer. Contrast that with the SeaDoo Spark Trixx, which is a PWC that’s designed for the rider to have fun going about 10 mph while performing stunts, and I can safely say my testing experience ran the gambit. 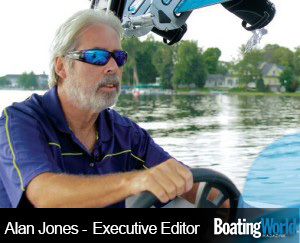 In 2016, I drove about 100 different boats and performed 61 full tests (so far), 25 of which are chronicled in this issue’s Boat Buyer’s Guide (beginning on page 46), which kicks off our 2017 season. What’s evident is this is a great year to be in the market for a new boat. Boat builders are aggressively exploring the bounds of the upper and lower price brackets, a trend perhaps best illustrated by the wakesurf boat segment. The most expensive boat we tested in this genre was MasterCraft’s top-of-the-line X26 Surf Edition, which boasted an astested price of $225,000. On the other end was the Heyday WT1 (Water Tractor), a no-frills, made-for-surfing boat that’s cute in a pug-like way but comes in at a beautiful price of less than $40K, including a trailer. The pontoon boat segment is still going strong. Performance seekers can go fast without buying a go-fast boat, as illustrated by the off-the-charts-crazy PlayCraft XTR (XTreme Poker Run) 2500, which featured a Mercury Racing 400 outboard that propelled it to 71 mph. We also tested plenty of twin-outboard pontoons, including the Manitou Legacy XPlode XT and its mind-blowing green metallic color scheme with color-matching Evinrude G2 250s — the visual statement of the year. But pontoons, being the most versatile of boats, can also deliver a luxurious, fun-filled package such as the Qwest LS 818; powered by a Torqeedo electric motor, it has a top speed barely in double digits. We were surprised that several manufacturers introduced fishing boats into their lineup. Witness the Scarab 195 Open Fish, a jetboat that has a flip-down tailgate, and Stingray’s new 186cc outboard-powered center console that has 16 rod holders and an option for a second livewell. Multispecies is the watchword for aluminum fishing boats such as the compact Princecraft Sport 164, the G3 Angler V17 and the Ranger RT 198P (yes, an aluminum Ranger). Deckboats and bowriders are still some of the most popular boats around, and we tested the full range, from Formula’s ultra-luxurious, surprisingly agile and yacht-certified BR 310 to the Hurricane SunDeck 187, which is less than 19 feet long but can hold up to 10 passengers. The takeaway for 2017 is that there is a boat for every lifestyle and budget, and we got on darn near all of them.